Research has shown that including a structured educational element in whale-watch tours can serve as a type of insurance to manage tourists’ expectations, and ensure that they have a pleasurable and enriching experience even if no whales dolphins are observed, or those that are observed are distant and/or do not engage in any spectacular behaviours1. Tourists appreciate and look for good environmental education during their tours2. Since research has proven that boat-based whale and dolphin watching has the potential to disturb the animals that are being watched3, many supporters of this form of eco-tourism focus on the scope to compensate for a potential negative impact with a positive contribution to conservation by educating tourists who take part4. Counter to some expectations, simply participating in a whale-watching tour and having the opportunity to see whales or dolphins in their natural habitat, is unlikely to have any lasting impact on tourists’ conservation outlook5,6. Being close to whales or dolphins is likely to create feelings of satisfaction, well-being, and emotional connection, but real changes in tourists’ understanding and willingness to contribute to conservation efforts will only take place when the tours include a deliberate and structured educational component7,8. 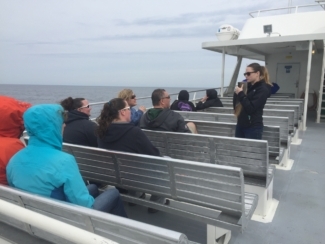 When an educational element is included in a whale-watch tour, it has the potential to be tourists’ first and most important source of information about whales and dolphins9. When structured properly, and followed up with repeated whale watch experiences and post-tour communication, it can actually change tourists’ outlook and willingness to engage in conservation activities6,8,10. Research shows that tourists appreciate structured educational programmes or “interpretation” on their tours and miss it when it is not offered2. Naturalist guide sharing information with tourists during a whale watching tour in the Gulf of Maine, USA. Photo courtesy of Whale and Dolphin Conservation US. A guide shows passengers a sample of seawater during a whale watching tour in Scotland. Photo courtesy of Chris Parsons. Anticipation of the Event: The time between visitors signing up to participate in a tour and boarding the boat can be a valuable time to begin the education process. Visitors will be eagerly anticipating their event and seeking information to help them prepare. Visitors at this stage can be encouraged to download information from the internet, including, species checklists, maps, or basic information on whale-watching and whale conservation in the area. You can find some examples of these types of materials here. This phase can also include a pre-boarding briefing, that includes information about safety, and setting realistic expectations for visitors (e.g. where the boat is going, what types of marine wildlife can be seen, etc.). It is important during this phase not to raise visitors’ expectations to much by guaranteeing (close) encounters or showing too many images or videos of animals engaged in spectacular behaviours that may not be observed on the day of the tour. Consider making the analogy made in our section on “what is responsible whale watching”: whale watching tour vessels are dropping in unannounced on whales and dolphins in their home environments. There is a chance the children will be in the front garden jumping on the trampoline and doing flips, but there is an equal or greater chance that the kids will be asleep and mum and dad will be resting on the couch, or that the whole family will have decided to go out for dinner and won’t be home at all. Travelling to the site: Many whale-watch destinations require a transit or searching time before whales/dolphins are encountered. This time can be used to opportunistically educate tourists about elements of the marine environment (passing birds, flying fish, clarity/turbidity of the water, weather conditions). Teaching tools, such as posters, posters, bones, teeth, baleen, 3D models of the ocean floor can also be used by guides engaging directly with tourists. This time can be taken to describe cues used to detect whales or dolphins in the area (blows, splashes, birds feeding at the surface, etc) or to describe what whales or dolphins might be doing in the area (migrating, feeding, nursing young etc). Guides may also use multimedia teaching tools on mobile tablets/iPads. On site experience: When whales or dolphins are encountered, it is important that tourists are guided by knowledgeable interpretation. McInnis and Johnson suggest dividing this interpretation into three stages that lead to increasingly specific/detailed information about what visitors are observing: 1) providing an accurate species identification, and pointing out the parts of the whale/dolphin that visitors can see, helping visitors understand how many animals are present, and what they are doing; 2) discussion of how their current behaviour fits into their life cycle – e.g. feeding, resting, socializing, etc. in order to impart more general information about the species; 3) more detailed information about individuals in the group, or the observed species’ conservation status and threats. This can be a powerful and emotional experience for many whale watchers, and it is important that the guide is present to help them interpret and process what they are seeing. It is also important to balance sobering information about threats to cetaceans with concrete suggestions of what guests can do to help whales and changes they can make in their lifestyles that will preserve the marine environment. Traveling from the site: The trip back to the dock/marina provides an opportunity to reinforce information given during the encounter and/or answer visitors’ questions and suggest ways to continue to follow and protect the whales. This is when it is most important to remember that tuning into passengers’ own questions and reflections can result in the most effective ‘teaching’ moments. The recollection phase and follow-up: This can take place on the dock after the tour, or through email and social media after guests have returned to their homes. Visitors can be given a “pledge sheet” to write down an action they will take in the next week/month to help whales and dolphins; a pocket guide to sustainable seafood to use in restaurants and supermarkets; links to websites and Apps that they can use to either follow the whales at the site or make more sustainable lifestyle choices. Guides on a whale watching tour in Saint Vincent and the Grenadines show passengers a poster developed with support from several NGOs promoting responsible whale watching. Photo courtesy of Fundación Cethus. A guide shows passengers a piece of whale baleen as the boat travels to the whale watching area. Photo courtesy Whale and Dolphin Conservation US. It is also important for tour operators to realise that they if they model responsible and sustainable behaviours customers are more likely to engage in sustainable conservation behaviours after their trip. Operators should think carefully about how they behave in the presence of whales or dolphins (do they respect approach guidelines and distances? ); what products they provide to passengers (do they use single-use disposable plastic? Or do they recycle and re-use things like cups, bottles, and thermoses); and what type of engines they use (do they leak oil or emit harmful fumes?)4. These behaviours are all aspects that tour operators can take into account when considering how to offer the best possible whale watching experience for clients. Parsons, E., The negative impacts of whale-watching. Journal of Marine Biology, 2012. 2012. Orams, M.B., P. Forestell, and J. Spring, What's in it for the Whales? : Exploring the potential contribution of environmental interpretation to conservation, in Whale-watching: Sustainable tourism and ecological management, J. Higham, L. Bejder, and R. Williams, Editors. 2014, Cambridge University Press: Cambridge, United Kingdom. p. 110-127. Johnson, G. and C. McInnis, Whale-watching: An effetive education programme is no fluke, in Whale-watching: Sustainable tourism and ecological management, J. Higham, L. Bejder, and R. Williams, Editors. 2014, Cambridge University Press: Cambridge, United Kingdom. p. 128-145. Forestell, P. and G. Kaufman. The history of whale watching in Hawaii and its role in enhancing visitor appreciation for endangered species. in Proceedings of the 1990 congress on coastal and marine tourism. 1990. National Coastal Resources Research Institute Corvallis, OR. 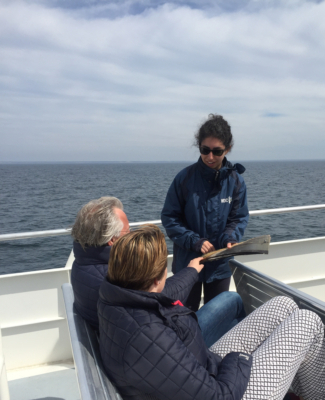 Forestell, P. and G. Kaufman, The anatomy of a whale watch: Marine tourism and environmental education. Current Journal of the National Marine Educators Association, 1992. 11(1): p. 10-15. Orams, M.B., The effectiveness of environmental education: can we turn tourists into "greenies'? Progress in Tourism and Hospitality Research, 1997. 3(4): p. 295-306. Hrycik, J.M. and P.H. Forestell, Change in Focus of Attention Among Whale-watch Passengers Occurs As a Function of Temporal Phase of the Tour. Tourism in Marine Environments, 2012. 8(4): p. 189-198.